Move over St. John's wort, saffron is poised to revolutionize natural mood management. 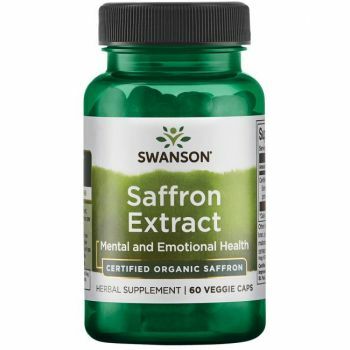 Breakthrough research conducted in the Middle East, where saffron is an integral part of both healthcare and cuisine, has found that saffron veggie capsules standardized for consistent levels of the active component safranal produce significant benefits for those who struggle to maintain stable, healthy moods. Our new Superior Herbs Standardized Saffron Extract conforms to the research standard, delivering 30 mg of 2% safranal extract in each capsule. Plus, we use only Certified 100% Organic Saffron Extract for guaranteed purity. Other ingredients: Organic oat bran, pullulan (vegetarian capsule), maltodextrin. Suggested use: As a dietary supplement, take one veggie capsule one to two times per day before meals. WARNING: Do not take this product if you are pregnant or nursing. Consult your healthcare provider before use if you are taking a prescription medication or if you have a medical condition.